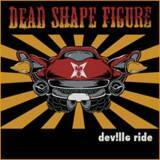 Dead Shape Figure is among the more interesting specimen’s of the Finnish underground scene. Since forming in 2003, running through two full-lengths and several smaller releases, the band has presented a very interesting take on thrash metal. Decidedly modern in their leanings, they’ve foregone any associations to the denim-vested crossover-types or similar straight-up old school associations. Sometimes dabbling with bursts of melodic death, sometimes technical mayhem with even a feint scent of grind for a moment or two, this group has definitely made a mission of finding that specific sound of their own. On Deville Ride, their second official EP, another unexpected turn is made to more straight-forward pastures. Opener Strangle The Hero starts with riffage that somehow recalls Nevermore at their least technical, just rocking it out with a driving chug. Singer Galzi’s voice is pulling off some mean clean vocals for most of the entire disc. There’s a vibe of Layne Staley present and I dunno, would Alice In Chains going a bit thrashier sound like this? maybe. Those exclusively banging through their debut LP The Grand Karoshi might even be taken aback for a moment by the vox – is this really is the same guy? If their second full-length, The Disease Of St. Vitus, is familiar to you, maybe you’re not that surprised. But the cleans are better here, much more so. Yes indeed and I can dig it. A few growls still left in there too, worry not. …And They Adore The Replacement continues this heavy rock atmosphere with a tasty clanging bass and a groove that can really make ya spin when backed by a great production such as the one found on this record. Awesome harmonizing lead melody between the guitars in the middle there. Leave Your Buildings starts off with a sharp mid-tempo riff that leaves you feeling like some perversion of classic 80s metal stomped by until the more atmospheric verse brings a proggy punch followed by a rocksteady chorus…man, these guys are working the apparent aim of relative simplicity. Cool guitar dueling again, no frills and really cool. If anything, the EP-ending punkish cover of Type O Negative’s Dead Again underscores the path of renewal that may have been opened on Deville Ride. It may be a bit much for the most stubborn thrashers out there, but this should open new fan bases for the group in the process. Notably recommended for fans of heavy music, boundaries be damned.